McKenzie Wark, Molecular Red: Theory for the Anthropocene. Verso, 2015. 304 pp. The contentious concept of the Anthropocene asks us to examine the role of human activity in transforming the earth. Beyond recognizing and understanding these transformations, however, the Anthropocene demands intervention on the level of everyday human practices. How ought one think about the production of knowledge in the radically new context of the Anthropocene and what forms of material practice are thereby indicated? 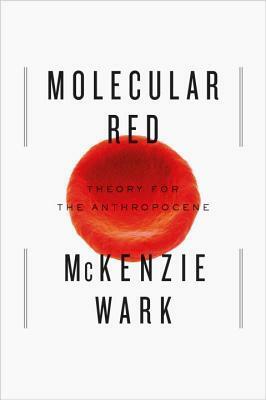 In his book Molecular Red: Theory for the Anthropocene, McKenzie Wark offers an accessible and creative engagement with these questions. Against high theory as “a policing faculty flying high as a drone over all the others” Wark returns again to the concept of “low theory”, described as “interstitial, its labor communicative rather than controlling” (218). His text is dense with the introduction of new vocabulary seeking to enable new practices of collective action and new capacities to know and feel our imbrication in the earth’s material and informational systems. Its terminological emphasis enriches our situational analyses by providing a strategic view of the contemporary moment. Through his four main interlocutors Wark offers some useful tools to understand the present and strategize towards new futures. By focusing on the interactions between these thinkers, his book gains both the creativity and the insulation of a bench prototype. In a work filled with great one-liners, Wark’s opening line is instructive. He revises Hippocrates by suggesting “disparate times call for disparate measures” (xi). In what follows he suggests that such measures ought to respond to the exigencies of today with an experimental interplay between existing and hypothesized forms of knowledge and action. This interplay appears to structure the text itself, as Wark’s book seems to model the practice of “substitution,” which he defines as “a kind of détournement, by which the formal properties of any given activity can become the experimental template for any other” (27). Substitution, one of a handful of concepts drawn from the first of his four authors, allows Wark to prototype experimental ways of knowing and being in the world from four seemingly disparate components. Wark clarifies the term, explaining that the attempt to link or combine disparate forms of knowledge is exemplified by Marx’s application of the concept of metabolism “from respiration in mammals to agricultural science to social-historical metabolism” (27). Throughout the text, substitution serves as a generative framework for synthesizing experimental ways of knowing and being in the world. Wark carries out this synthesis over the course of the book’s two parts composed of two chapters each. Part one, “Labor and Nature”, discusses the lesser-known Soviet theorist Alexander Bogdanov (Chapter One) and Soviet writer Andrei Platonov (Chapter Two). Part two, “Science and Utopia”, engages American feminist philosopher of science, Donna Haraway (Chapter Three) and science fiction writer Kim Stanley Robinson, also American (Chapter Four). Wark holds up these four thinkers as important elements of the “intellectual knapsack” (119) necessary for our journey into an unfamiliar new age. In Chapter One, Wark explores Bogdanov’s tektology, an attempt synthesize widely disparate fields of knowledge into a type of unified model that could improve both our understanding of ‘nature’ and our systems of organizing human and non-human labor that shape it and are shaped by it. As Wark explains, “neither a theory or a science, tektology is a practice which generalizes the act of substitution by which one thing is understood metaphorically via another” (25). Wark rejects Bogdanov’s tendency to think of tektology as imposing “a rather authoritarian” (25) relation between collective labor and nature. Instead he initially argues for thinking of nature as “a category without a content…simply that which labor encounters” and of labor as always operating both “in and against nature” (4). But, he cautions, “[b]efore a tektology of organizing the material world can apply,” what Wark calls a “proletkult” (based on the Soviet institution of the same name) has to emerge “within which workers acquire for themselves the confidence to organize the world” (29). As tektology offers labor a new practice of knowledge, the proletkult offers labor its own “means of cultural development” (xvii). “Tektology” and “proletkult” mark an aspiration towards a new organization of knowledge and a new concept of cultural formation, which when taken together may help us develop new political and material practices. Wark’s second chapter offers a close look at writer Andrey Platonov whose “condensed emblems of the Soviet experience”(62) reflect the goals if not the institutional success of the Proletkult. Through this chapter Wark shows us Platonov as “the writer of the material practice of popular sense-making” (65). Wark describes Platonov’s method as détournement, or “the collective labor of unmaking from below the language of those above” (65) and how he achieved “critical purchase through attention to those personae closest to the struggle to wrest a surplus from nature” (69). Wark suggests that Platonov seeks not to mirror reality, but rather to shape it, a reading that evokes both Brecht and Nietzsche’s hammers. Quoting Platonov, “words are just social materials and they are very malleable and reversible” (110). The fundamental materiality of language is why both Bogdanov and Platonov care so deeply about the technical means by which these materials are produced, transformed, and distributed. For Wark, Platonov’s writing offers an intimate tektology of the “comradely” relations between human lives, inanimate matter, and broad socio-political and environmental systems. Unlike Bogdanov, who sought to map “the most advanced, general and complex forms of social activity” (27), Platonov engages the materiality, plasticity, and power of language for social struggle from the “labor point of view” in order to express the possibilities of “comradely life” between human and non-human life, technology, and the earth itself. Not one for naïve optimism, Platonov also writes from “below the below,” highlighting the impediments to such comradely existence through his “barely proletarian” characters, “orphans, landless, wanderers…” (68). From a position of critical distance Wark approaches the “barely proletarian” of today, seeking new permutations of “low theory” to help tell a new story of the Anthropocene. In an historical moment of largely unprecedented dispossession, indebtedness, and inequality, he suggests the importance of “new kinds of labor for a new kind of nature” understood as a “multi-species becoming-with” born of new affinities among human, more-than-human, and geological forces. This is a call to abandon the reductive imaginary of a pure Edenic nature sullied or exhausted by human activity, and embrace a relational analysis which understands human (re)productive practices as historically inextricable from their constitutive material, conceptual, and affective forces. In this view, the limits of human civilization are not the capacity for capital to extract value from exogenous and finite material stocks but the ways new “comradely alliances” might capture a surplus in service of a just and sustainable world. Wark’s fourth chapter brings his readers into the space between a fraught present and an underdetermined future via the work of contemporary science fiction author Kim Stanley Robinson, specifically his monumental Mars Trilogy (Red Mars , Blue Mars , Green Mars ). Robinson’s style of ‘hard’ science-fiction combines philosophical depth with an “alternative realism…formed by past experience, but not confined to it” (xxi). Robinson expresses in his trilogy both a tektology wherein multiple forms of knowledge and practice intersect in the creation of a permanent Martian settlement, and a proletkult that probes the horizon of utopian possibility for new forms of social organization. Wark productively contrasts the “bourgeois prose” of Defoe’s Robinson Crusoe with Robinson’s Mars Trilogy, arguing that Defoe’s prose represents a “precursor to capitalist realism” (183) by describing a world populated only by “potential tools and resources” with which the lone protagonist seeks to reproduce the world as it exists elsewhere. For Crusoe, the measure of successful practice is its capacity to reproduce existing society. In contrast, the divergent understandings of success pursued by the main characters of the Mars Trilogy are among its central animating conflicts. Wark notes, “As in Platonov, characters [in the Mars Trilogy] each bear out a certain concept of what praxis could be. Over the course of the three books…these positions will evolve, clash, collaborate, and out of their matrix form the structure not just of a new polity but of a new economy, culture, and even nature” (183-185). The trilogy narrates a familiar interplay between pragmatism and utopianism as these characters struggle with and against one another and the recalcitrant planet itself. One focal point of conflict in Robinson’s text is the question of terraforming, with some characters seeking to minimize human impact to preserve an original Martian ‘nature’, while others seek to transform the planetary environment to suit human needs as rapidly as possible. Wark’s attention to this conflict allows him to discuss the reciprocal relationship of profound transformation between humans and their milieu. A character in Red Mars highlights the importance of this relationship, “Some of us here can accept transforming the entire physical reality of this planet, without doing a single thing to change ourselves or the way we live … We must terraform not only Mars, but ourselves” (187). The machinery of transformation must certainly include technical and infrastructural concerns in the broadest sense, but also the concepts and affective attachments through which humans may come to live otherwise. Robinson suggests that in order to be moved towards a utopian horizon “a new structure of feeling has to come into existence, not after but before the new world” (188). In Robinson we find a more explicitly cyborg tektology than in Platonov, one that bridges scientific and artistic practices as forms of sense-making and world-making. Wark suggest that on Robinson’s Mars “… the whole organization of the planet has become an artwork, although one heavily dependent on, and respectful of, scientific method” (209). Indeed, over the course of the series Robinson repeatedly contests a hard boundary between arts and science, suggesting instead that both be understood (in an ideal sense, and absent the distorting force of the profit motive) as the exploratory play of perception and action. But this open-ended understanding begs a challenging question. By what means can we adjudicate on the creative and open-ended practices of world-making and sense-making? As Haraway notes elsewhere “The point is to get at how worlds are made and unmade, in order to participate in the processes, in order to foster some forms of life and not others” (Haraway 62). Today, faced with a radically transformed earth, we cannot tacitly accept the forms of life out of which we cohere as subjects. Rather, to extend the machinic metaphor, we must ‘hack’ the multiple overlapping and interdependent systems of both violence and provision into which human/non-human lives and landscapes are uniquely imbricated. Humanity, then, is best understood not as a homogeneous group charged with perpetrating or preventing human effects upon an external ‘nature’. Rather, we begin to locate our own lives within the creation and destruction of various forms of life as composed in-situ by the dynamic relations of human, more-than-human, and geological forces. For Wark, “the Anthropocene draws attention to androgenic climate change as an unintended consequence of collective human labor” (180). Thus, two things must accompany the production of progressively more fine-grained catalogues of violence in the Anthropocene. First, tactical readings of the relations that capture collective human/non-human labor today; and second, compelling visions of collective multi-species and cyborg labor as a force for unmaking and remaking the world. With Molecular Red Wark joins other authors examining the implications of the Anthropocene such as Kathryn Yusoff, Timothy Morton, Claire Colebrook, Heather Davis, and Jason Moore each of whom pose crucial questions about the status of the human, about aesthetic and political practice, about knowledge, and about science. Wark attempts to formulate a “Theory for the Anthropocene” by outlining tools for a poetics of sense-making. These tools are valuable on the level of strategy, which is to say that they provide us with a vocabulary and a framework to articulate broad goals and to re-diagram the terrain of political struggle. Wark succeeds in theorizing alternative organizations of knowledge and signaling how they might be politically useful, while retaining a certain distance from really existing practices of tektology or the proletkult. As Wark highlights in his blog and other shorter-form writings, projects of tektology and the proletkult are not just a horizon to which one might aspire. Such projects exist here and now, some even partially inspired by Wark’s previous writing on media, culture, and technology. Examples of these projects include the Open Source Ecology (OSE) project, the Utopia School, the Public School, and 1882 Woodbine all of which seek the radical reorganization of the relations that compose human lives. An examination of these projects in Wark’s terms reveal them to be extant expressions of tektology and the proletkult, concretely reorganizing material, informational, and affective relations on both practical and utopian registers. In his first chapter, Wark suggests Bogdanov cannot “stop himself from engaging in a system-building that overshoots the limits of his own core principles”(29). Wark maintains, however, that Bogdanov made a “good case” for his philosophy “as the last necessary philosophy, and tektology as the beginning of something else” (29). Wark’s text shows a similar tension. He makes a good case that traditional philosophy and critical theory need to change in light of today’s circumstances. While it does provide a certain critical distance, his prototype’s insulation also makes this “something else” seem nascent and yet-to-come. But the long tradition of philosopher-inventors, of bricoleurs hammering ideas and matter persists and Wark’s text remains a timely and creative prototype. It provides new theoretical and utopian vocabulary while clarifying the challenging yet dire work ahead. If extant examples of tektology and the proletkult are not emphasized perhaps it is because Wark knows that the onus lies—as it must—on his readers; each of us who would experiment with new relations while uniquely situated within a precarious and hostile present. Haraway, Donna Jeanne. “A Game of Cat’s Cradle: Science Studies, Feminist Theory, Cultural Studies.” Configurations 2.1 (1994): 59–71. Project MUSE. Web. Wark, McKenzie. “Heidegger and Geology.” Public Seminar. N.p., 6/26/2014. Web. Scranton, Roy, Stephanie Wakefield, and McKenzie Wark. Theory for the Anthropocene. Wollman Hall, Eugene Lang College, NY, NY: Public Seminar, 10/23/2015. YouTube. Dr. Gabriel Piser is an educator and consultant working towards environmental and economic justice using theoretically-informed, collaborative, and action-oriented research methods. His previous research examined how Appalachian people and landscapes shape –and are shaped by– regional development conflicts. He is currently working with the Kirwan Institute for the Study of Race and Ethnicity, the Prison Ecology Project, and the Fight Toxic Prisons campaign. He collaborates broadly with others seeking to better understand the present and to imagine and enact desirable futures.